With it being All Hallow's Eve, there will be an uptick in the number of feral children running loose in my neighbourhood tonight. Ok, so they're not feral, but they are going to be searching for sugary treats on their annual Trick-or-Treat adventure. Being that HBIC Headquarters is located squarely in a neighbourhood with children, I will be watching the Jets and Wild battle while attempting to satiate the kids who appear on my doorstep. While we're on the topic of the Jets and Wild, Winnipeg has a shot at moving into second-place in the Central Division tonight with a win. That's a sentence that I'm not used to writing, but we're one month into the NHL season and I can honestly say that the Jets have proven me wrong. I spoke at length on The Hockey Show that the Jets should consider themselves lucky if they finish the first twelve games with a .500 record. A win tonight would guarantee that they finish no worse than .500, and they're already better than .500 in terms of poins percentage thanks to a couple of overtime losses. I also fully admit that my harping of how the Jets could be 2-10-0 in their first twelve games is also way off, so I'll fully eat the massive amount of crow that I deserve after the Jets have already put five wins on the board. There are still 71 games in the NHL season after tonight's game against the Wild, so anything is far from being decided. That being said, the Jets have found some ways to win, they've received some decent support from AHL call-ups, and Connor Hellebuyck has been better than good in starting this season without a regulation loss and without surrendering what would categorized as a bad goal. While some may needle me by reminding me that the Matt Hendricks era in Winnipeg has yet to post a regulation loss, I will say that the Jets won't go 71-0-0 in their next 71 games. They have been better, though, and that's encouraging after the team came out of the gates against Toronto looking like they wanted to be anywhere but on the ice. The consistency is what matters, and the Jets have found it as of late which is also encouraging. Another win against a division foe would go a long way tonight, so here's hoping the Jets can put together another solid game for an additional two points. They'll go a long way in a season where every point matters. And with that, the wee candy seekers have arrived at my door. I'm off! I need to tell you all something that may shock you. I haven't watched one second of the Netflix series Stranger Things. As hard as that may be for some of you to process, I just haven't had the time or the inclination to sit down and consume the first season of the show. With the second season now out, I'm thoroughly behind in the series, so I'll need a weekend binge session to catch up and process all that is contained. Do I ever have a weekend where that can happpen? Sadly, no. For this years Calgary Flames Halloween themed game I created a Stranger Things inspired poster and one minute video. 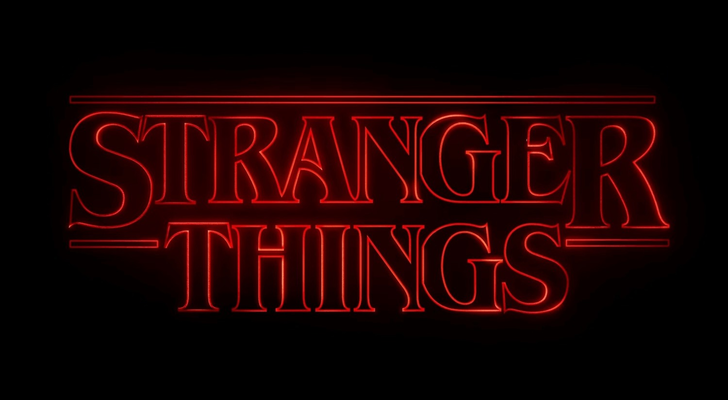 The poster was based off of Kyle Lambert's artwork for the popular Netflix series. For the one minute video I copied the opening credits frame by frame. I tried my best to emulate the organic approach Imaginary Forces used when they created the title sequence. The results that Mr. Kenworthy came up with are pretty impressive. Basing my knowledge of the series solely on Mr. Kenworthy's video, I'd say that's a pretty awesome intro. This is the second great video we've seen the Flames featured in after last week's SNL parody. You would think that more NHL teams would reach out to people of this level of creativity and hire them to do some work, right? Mr. Kenworthy's video is top-notch, so here's hoping the Flames or another team come calling! We're four weeks and eight games in, and we're starting to see some separation in the standings. There's no doubt that there will be a race for first-place in Canada West with the five thoroughbreds that have emerged from the pack, but they'll have to at the top of their games to rise above the other seven teams. As we hit the conference bye week, who finished off the first quarter of the season strongly? Let's check out the action from this past weekend on The Rundown! LETHBRIDGE at UBC: The Pronghorns went west across the Rockies into Vancouver where they met the first-place UBC Thunderbirds. Lethbridge's Alicia Anderson has been the goaltending story early on this season. Could she power the Pronghorns to another victory? UBC used their home-ice advantage in a big way in the first period, outshooting the Pronghorns 15-4 as they dominated all the statistical categories except goal-scoring. While Anderson held off the T-Birds for the majority of the period, Logan Boyd finally got a puck through the Lethbridge wall on the power-play off an Ireland Perrott pass at 15:38. The Pronghorns, however, would make good on one of those four shots when Delaney Duchek intercepted a cross-ice pass at the blue line while shorthanded, and she was off to the races. Duchek found some space on Tory Micklash with her shot, and the shorthanded marker tied the game 1-1 at the 19:22 mark! The second period saw UBC open another wide margin in shots, but it was Anderson who stole the spotlight. Logan Boyd would solve Anderson once more in this period as she drove the net hard, had her initial shot stopped, but corralled the rebound and flipped the puck past Anderson at 14:13 to make it a 2-1 UBC lead! At the end of forty minutes, UBC held the lead on the scoreboard and in shots with a 29-10 advantage. The third period would be more of the same as UBC continued to throw everything - including a kitchen sink, I believe - at Anderson and the Pronghorns, but Anderson was simply outstanding on this night. If the Pronghorns could have found the back of the net with any of their six shots in the third period, this would have been anyone's game. In the end, both Micklash and Anderson posted a clean period, and that left UBC standing at the final horn with a 2-1 victory. Micklash made 15 saves in the win while Anderson stopped 41 shots in the loss! LETHBRIDGE at UBC: Game Two went on Saturday, and there was a chance for head coach Graham Thomas to hit a major milestone with his 100th Canada West regular season win! Of course, the Pronghorns wanted to delay that celebration for at least one more week. The Birds would give their head coach a lead at 9:07 when Kathleen Cahoon picked up a loose puck in the slot and fired a shot past Alicia Anderson for the 1-0 lead. There wouldn't be any other goals in the period as Anderson was simply jaw-dropping again on Saturday in making 17 saves in the opening frame as UBC posted an 18-4 shot advantage. The second period saw the two teams work on their power-plays as Lethbridge went oh-fer-five in the period while UBC went oh-fer-three. The shot totals also evened out with the extensive extra player time, but there would be no goals as the two teams sent ten shots each on the opposition's goalie in the middle frame. Lethbridge literally took the game to UBC for the first time in the third period, but Amelia Boughn was having none of it as she rejected all ten shots she saw. In saying that, Lethbridge couldn't find the twine on Saturday, and the UBC Thunderbirds came away with the 1-0 victory! 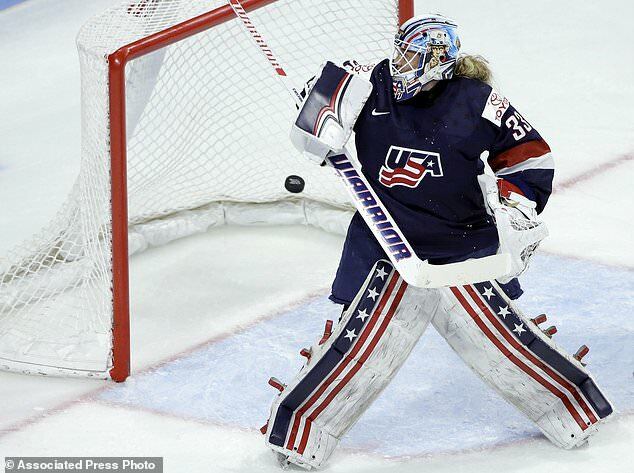 Boughn was perfect on all 24 shots she faced for the shutout win while Anderson stopped 30 of 31 shots in the loss. CALGARY at SASKATCHEWAN: The Dinos went east in the search of points against a Huskies team that has been in every game they've played this season. And it seemed that these two teams had one another figured out for about fifty minutes, but it would be the final ten minutes where one team made its push. The ice was definitely slanted towards the Dinos' end in the first two periods as Saskatchewan built a 33-6 advantage in shots. Kelsey Roberts was ridiculous in the Calgary net, denying chance after chance and wave after wave of the Huskies' attack. The fact that the Huskies couldn't solve her in the first forty minutes shows just how good Roberts has been for the Dinos this season with her sub-2.00 GAA and nearly .950 save percentage. In the third period, the Huskies would finally break the stalemate. Kaitlin Willoughby's shot was kicked aside by Roberts, but Kira Bannatyne picked up the rebound and reached across the net to slide home the puck before Roberts could recover at 10:26, giving Saskatchewan the 1-0 lead. Six minutes later, Bailee Bourassa would be stopped on her initial shot on a partial breakaway, but she tucked her own rebound past Roberts on her left at 16:07 to make it a 2-0 game. Kori Herner would deposit the puck into an empty net with 28 seconds to play as the Dinos had pulled Roberts for the extra attacker, but they wouldn't solve Jasey Book on this night as Saskatchewan took this game by a 3-0 score. Book stopped all 13 shots for the shutout victory while Roberts deserved a better fate after stopping 43 of 45 shots she faced on Friday. Highlights are below! CALGARY at SASKATCHEWAN: I don't know what was happening in this game, but the Calgary Dinos only dressed fifteen players, including freshman third-string netminder Kira Wasylak - the only goalie dressed for the Dinos on this day. If there's illness running through the Dinos' dressing room, getting the conference bye next week might just be what the doctor ordered. It didn't take long for the Huskies to open the scoring in this one. Kennedy Harris and Bailee Bourassa broke in on a two-on-one early, and Kennedy went high glove-side on Wasylak to open the scoring just 1:04 into the game. The rookie, however, would settle down as Wasylak stopped the next ten shots in a row to keep the game at 1-0 through twenty minutes of play despite the Dinos being outshot 11-4. Not surprisingly, the Dinos would play a very conservative game with just fourteen players on the bench. They certainly weren't going to outshoot the Huskies, but it should be noted that the Dinos did everything they could to help Wasylak over the final 58:52. Saskatchewan would outshoot the Dinos by a 40-12 margin over those 58 minutes, but that very first shot that got by Wasylak would be the difference on this night as Saskatchewan got past a Herculean effort by the fifteen dressed Dinos in a 1-0 win. Chloe Marshall earned the shutout in stopping all 12 shots she faced while Wasylak's trial-by-fire saw her stop 40 of 41 shots sent her way. MANITOBA at MOUNT ROYAL: The Bisons stampeded into Calgary to take on the Cougars. With Manitoba having split each of their first three weekend series, they were looking for some consistency in winning a pair of games on one weekend. Mount Royal, having found some traction against Lethbridge a week before, wanted to begin the climb up the standings by putting the Bisons on the defensive. Manitoba, though, would use their top-ranked power-play to get themselves going on Friday as Jordy Zacharias teed a puck up from the point that only glanced off Zoe DeBeauville's glove before bulging the twine at 12:09 for the 1-0 lead. The Cougars would use a power-play of their own minutes later to draw even. Rachel Piitz spotted Kate Hufnagel in the slot, and her pass was redirected by Hufnagel through Rachel Dyck's five-hole at 15:42 to make it 1-1. The second period saw the seesaw battle continue as it appeared Piitz was about to give the Cougars the lead on a breakaway, but Rachel Dyck made an outstanding glove save as she reached back to prevent the puck from sliding across the goal line. This seemed to spark the Bisons. Lauryn Keen forced a turnover at center ice and she streaked back into the Cougars' zone where she unleashed a slapshot that found room between DeBeauville and the post to pit Manitoba up 2-1 at the 13:16 mark. The Cougars, though, wouldn't go away. Nicollette Seper made a great move to split the defence and get a shot away, but it was stopped by Dyck. Sepercollected her rebound, though, and slid the puck under Dyck to make it a 2-2 game at 15:44. For an undisclosed reason, Lauren Taraschuk came out to the blue paint for Manitoba to start the third period. The Bisons were intent on reclaiming the lead, and their pressure was rewarded. Jordy Zacharias found Alanna Sharman who one-timed a blast past DeBeauville at 6:55, and Zacharias got her second of the night six minutes later when she finished off a sweet play with a gorgeous backhand goal at 12:26 to put Manitoba out in front 4-2. Despite a late Nicollette Seper goal with 58 seconds to play, the Cougars couldn't find an equalizer on this night as the Bisons skated to a 4-3 win. Lauren Taraschuk earned the win in her one period of play by stopping five of six shots she faced while Zoe DeBeauville made 18 saves in the loss. For those keeping track at home, Rachel Dyck stopped six of eight shots she faced in her forty minutes in the blue paint. MANITOBA at MOUNT ROYAL: Saturday's affair started off with some incredible end-to-end action as both teams appeared to want to grab control in this game. While Manitoba had a couple of glorious opportunities, Mount Royal seemed a little off as they failed to put a lot of pressure on Manitoba starter Lauren Taraschuk. The Bisons would finally convert one of their chances while on the power-play when Venla Hovi teed up a slap shot that went in off the post past Zoe DeBeauville at 19:52 for the 1-0 lead! From that point on, both goaltenders put up walls in their respective nets. DeBeauville stopped another twelve shots over the next forty minutes while Taraschuk stopped an additional 13 shots to go along with the three saves she made in the first period. When the final buzzer sounded, Taraschuk had backstopped the Bisons to a 1-0 win! As stated above, Taraschuk stopped 16 shots for her first U SPORTS shutout while Zoe DeBeauville made twenty stops in the loss. REGINA at ALBERTA: In the big series of the weekend, the top-ranked Alberta Pandas hosted the Regina Cougars in a battle for second-place in Canada West. If you were looking for up-tempo, end-to-end action, these two teams didn't disappoint. Alberta's Dayna Owen and Regina's Jane Kish were each up to the task through the first two periods as they battled to a scoreless draw through forty minutes with Kish stopping 12 shots and Owen making 23 saves. The third period saw Alberta strike on the power-play when Amy Boucher picked up her own centering pass and fired a shot past Kish's glove as she was falling to put Alberta up 1-0 at the 3:32 mark. Regina would find the tying goal five minutes later when Tamara McVannel tipped a Sarah Hornoi's shot past Owen at 8:37. The Pandas would respond again often a beautiful cross-ice pass from Kennedy Ganzer to Abby Benning at 10:41. These Cougars, though, haven't stopped playing all season, and Friday was no different. With a mad scramble happening around Owen, Emma Waldenberger used her long reach to find a puck in the crease and whack home the tying goal with just 39 seconds to play! Waldenberger's goal also sent this game off to some free hockey, but nothing would be solved in the four-on-four period. The same results were found in the three-on-three period, so we'd need a skills competition to find the extra point! In the opening round of the shootout, Kennedy Ganser's attempt was stopped, but Regina's Kylie Kupper found the twine to give Regina the lead. Both Hannah Olenyk and Emma Waldenberger were stopped in the second round, so it was up to Amy Boucher. Boucher made a deke that Kish stayed with the entire way, giving Regina the 3-2 shootout win! Kish made 26 saves plus three more in the skills competition for the win while Owen stopped 43 shots plus one more in the shootout loss. REGINA at ALBERTA: After Friday's game, what else could these two teams bring to the table? Playoff hockey in Week Four isn't something we usually see! Alberta got the ball rolling late in the first period in this game. Kennedy Ganser appeared to pick up a puck that Alex Poznikoff overskated, and she surprised Jane Kish with a quick shot that snuck between her left arm and body to give Alberta the 1-0 lead at 17:14. The only goal of the second period came late in the frame. Alberta couldn't clear their zone, allowing Mariah McKersie to skate the puck into the right face-off circle where she wristed a shot on net. Jordan Kulbida got her stick loose in front of Kirsten Chamberlin, and her deflection knocked the puck past the Alberta netminder to even the game at 1-1 at the 15:43 mark! In the third period, the Pandas went to work on a two-player advantage midway through the period. Kennedy Ganser skated the puck from the left point to the middle of the ice, fired a blast on net that Kish stopped, but Deanna Morin was in perfect position to whack home the rebound to give Alberta a 2-1 lead at 13:06. Again, these Cougars would net a late goal to not allow the Pandas to grab three points, albeit this of the lucky variety. Bailey Braden's slap shot on the power-play was going to go wide of the net on the far side, but the puck hit Alberta defender Morgan Kelly in front of the net and redirected into the Alberta net at 17:47 to tie the game at 2-2! In the second-straight game with extra time, we wouldn't need to wait very long for a winner to be scored on this night. In he first overtime period, Alex Poznikoff chipped the puck past Mackenzie Hutchinson at the Regina blue line, sending her in alone on Kish. she made a quick forehand-backhand deke to open up Kish's five-hole, and slid the puck between the netminder's legs at 1:48 of overtime for the 3-2 win! Chamberlin stopped 23 shots in the overtime victory while Kish stopped 32 shots in helping the Cougars grab a point in this game. Highlights of the game are below! As you can see above, there is a bit of a jam at the top of the standings as three points - one regulation win - separate first-place from fifth-place. While the top-five teams pull away from the bottom-three teams, it will be interesting to see who comes out of the conference bye week with a little fire under their skates. We'll look at the November schedule next week on The Rundown as these eight teams begin to figure out where they will either play or watch the Canada West playoffs! It has been said in many sports that winning erases all problems. As long as teams win, the little mistakes are often overlooked until they actually come back to haunt the team who had been winning. While coaches will generally cringe at that attitude, a lot of athletes seem to follow this idea because it doesn't matter how one wins, but rather it only matters that one does win. In saying that, it's all about how you finish in that case, and tonight we have examples of a good finish and one that may haunt a team for a while. We'll start in Boston where the Kings and Bruins were battling. The game went into overtime tied 1-1, and it looked like we were headed for everyone's favorite event of any NHL game: the skills competition! That is, however, until Tyler Toffoli was sent over the boards with a second left in the free hockey. Toffoli's goal came with 0.4 seconds remaining in the game as Tuukka Rask couldn't stop the one-timer off the Anze Kopitar face-off win. That execution is outstanding, and it shows that even with smallest amount of time remaining that players shouldn't stop playing! Well done, Kings, on some outstanding communication and execution to grab the extra point with Jonathan Quick on the bench in three-on-three time! On the other hand, I feel for Lindsey Post. Post, as you know, was one of the most dominant players to even come out of Canada West women's hockey, and she was drafted into the CWHL by the Calgary Inferno. Post was one of those goalies that, despite her playing for the opposition, you had to respect simply due to the fact that she could win you a game singlehandedly at the Canadian university level. She has yet to win a game on her own in the CWHL, but the goal that Kunlun scored tonight is one that she's going to want back in a big way. Oi vay. That goal, scored by Annina Rajahuhta, went off the end boards and off Post into the net in overtime just ahead of the final horn to give Kunlun Red Star their first CWHL victory with the 4-3 final. In Post's defence on this play, I don't even see the puck as it disappeared once it went above the boards. However, it seems she had an idea of where it was as she turned her head to look to her right. Maybe she just didn't pick the puck up off the boards in time? Whatever the case, I'm sure Lindsey Post would like this one back as her Inferno only grab a single point on the night on the misplay of that puck. In both cases, players should note that these games were won in the final seconds of overtime. I know I've seen players let up as time is winding down, so you should still try to maximize your effort until that final whistle is blown. 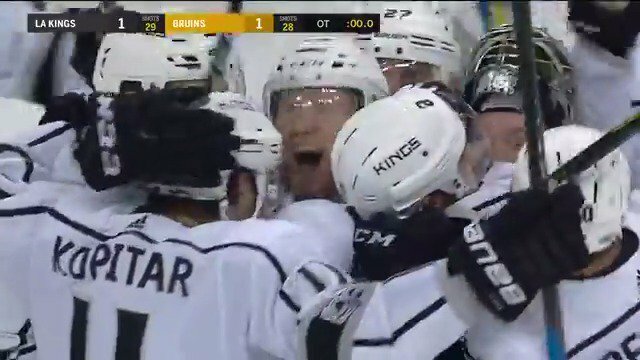 After all, the Kings and Red Star grabbed two points out of playing to the buzzer rather than taking their chances in the shootout. That's smart hockey, and those points may prove valuable down the stretch when the playoff races tighten! Good teams use every second on the clock to win as we saw tonight. 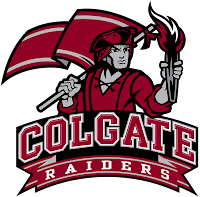 If you follow HBIC, you know that I've chosen the Colgate Raiders as my new NCAA women's hockey program to follow. After jumping out to a 6-0-0 start, there are a lot of people, myself included, that believe this squad could challenge for a national championship with the skill they have. This weekend, though, would be a solid test beginning with tonight's game against the second-ranked team in the nation in the Clarkson Golden Knights who entered tonight's game boasting a 24-game unbeaten streak. No one said it would be easy climbing the mountain, but the Raiders appeared to be ready for the challenge! The Raiders and Golden Knights are actually very evenly-matched when you look at their strengths and weaknesses, so I expected a low-scoring, tight-checking affair where mistakes may be costly. It started that way when the Golden Knights took a 1-0 lead, but Bailey Larson showed some great fundamentals in following her shot to the net where she found a puck that bounced back across the crease to tuck it home to make it a 1-1 game at the 13:00 mark! Despite going into the intermission down 2-1, Colgate rallied again in the second period at the 6:24 mark when Annika Zalewski notched a power-play goal to make it a 2-2 game after the Raiders showed some great patience in finding Zalewski open in the slot in the Golden Knights' zone. Colgate would retake the lead before the second intermission with a power-play goal of their own, so it was all on Colgate in the third period to find an equalizer as they trailed 3-2. And who would find the all-important tying goal? None other than Malia Schneider just 1:22 into the final frame! There would be no additional scoring in regulation time, so it was off to extra time for some free hockey! A 24-game unbeaten streak was on the line when the puck was dropped, and a winner was found at 1:44 of the extra frame. That, folks, was Megan Sullivan scoring at 1:18 of the overtime period to break Clarkson's 24-game unbeaten streak and give the fifth-ranked Colgate Raiders a win over the second-ranked Clarkson Golden Knights! The win also pushes Colgate to a 7-0-0 start - the first time tey have achieved that record in their first seven games in program history! In other words, Sullivan's goal was a huge goal for a number of reasons, and her third goal of the season might be the biggest goal of the season thus far! Julia Vandyk picked up the win, making 22 saves on 25 shots, as she picked up her second win of the season in as many games and her 33rd win in her NCAA career. If you're into superstitions, she also wears #33, so maybe there was a little magic hiding in today's game as well! The weekend doesn't get any easier despite the huge win tomorrow as the team travels to Canton, New York for a battle with the seventh-ranked St. Lawrence Saints. Can the Raiders make it 8-0-0 on the season? If they play like they did today, there's a good chance they will set another mark for the program! Of course, the Saints may have something to say about that, but we'll see what happens! 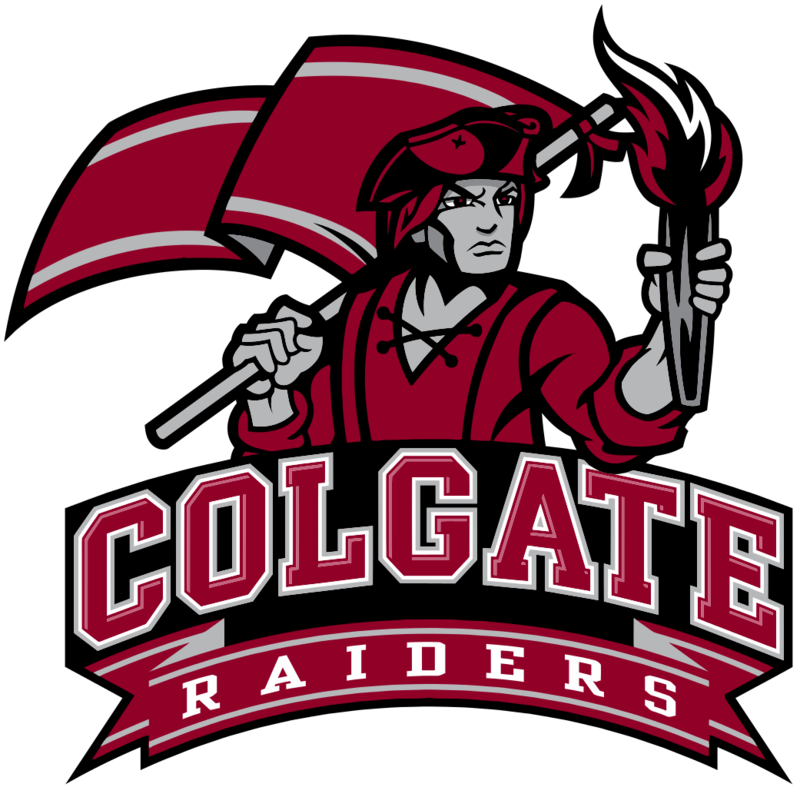 Congratulations to the Colgate Raiders on their historic start and huge win! The Hockey Show, Canada's only campus-produced radio show that strictly talks hockey, is going to have a little fun tonight. With the Penguins and Jets prepared to do battle at 6pm CT, we'll keep an eye on that score as the team introduces us to the wonders of Matt Hendricks. There's been some international women's hockey played, there has been a few U SPORTS games played, Beans and I will probably have a chat about the Flames and their awesome introduction video, and we'll go over the starts for the Moose and the Brandon Wheat Kings. If there's time, we'll take a tour of Europe and update everyone on the Aalborg Pirates, Amanda Schubert, and more on tonight's episode of The Hockey Show! Beans and I will discuss the Jets meeting the Penguins prior to puck-drop in Pittsburgh tonight. We'll also discuss what went down in the last week in Quebec City and Boston as Canada and the US renewed their rivalry as they prepare for the Four Nations Cup and, ultimately, the 2018 Pyeongchang Winter Olympics. We'll look at how the Moose are doing, look at the rather impressive start to the WHL season for the Brandon Wheat Kings, touch upon the Bisons and their battles, discuss the awesome video made - and pulled down - by the Calgary Flames, talk about Friend of the Show Jared Keeso and the news surrounding him, and we'll finish it off by checking out the European scene! Wanna listen, but not be stuck beside your radio? We suggest that you download the UMFM app on your phone or tablet. It's the easiest and most convenient way to listen to any of UMFM's great shows any time of the day, so go get it! Just follow this link on your iDevice or this link for your Android device and get the UMFM app! It's never been easier to tune into The Hockey Show or UMFM! Download the UMFM app today, and don't miss any of our great programming or shows! Tonight, Teebz and Beans talk Jets, Moose, Canada, the US, Wheat Kings, Flames, Jared Keeso, Letterkenny, and European friends only on The Hockey Show found on 101.5 UMFM and on the UMFM app! If you were home on Saturday and watching Hockey Night in Canada, you may have caught the super-creative parody that the Calgary Flames did in the style of Saturday Night Live's opening. 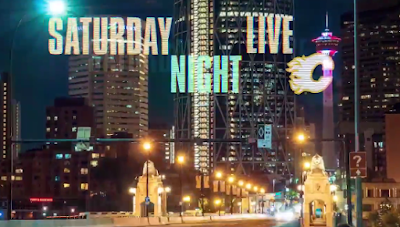 Rather than having all the SNL players in various scenes, the Flames put their players in places and filmed the action to look identical to SNL's opening montage. In short, it was rather awesome and I give credit to the team that came up with and ultimately made this happen. It seems, though, that there was one little checkbox they forgot to check when they posted their opening online. I saw the opening montage and it was pretty spectacular in its execution. 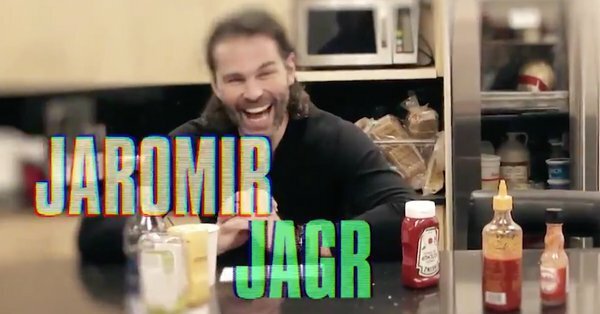 How many times would you ever see Jagr like this? The answer should be "never", so consider yourself lucky that someone took a screenshot or two because it seems the Flames have erased all evidence of it ever being produced from their Twitter page, their Facebook page, and any other place where it was linked. Without knowing for sure, I'm guessing that someone at NBC caught the parody and wasn't thrilled with the Flames' creativity. Cue the lawyers and the cease and desist letters. I went searching for it in the hopes that someone did the smart things and ripped the video from the Flames' social media site. Well, after much scouring of the internet, here is the parody in its entirety, and it's an amazing piece of video! Now you might be asking why I didn't embed it? I really don't want a cease-and-desist letter from NBC. I'll let the Flames and the various uploaders deal with those. But that's pretty darn awesome, right? Well done, Flames, on kicking Saturday night up a notch! It's always nice to see great things happen to great people. As you may be aware, The Hockey Show has had a fairly good relationship with the guys from Letterkenny in terms of having them on the show and having a few laughs with them. Jared Keeso, Nathan Dales, and Tyler Johnson have all come on the show, and we've talked to them about the epic CraveTV program that centers around Wayne and Daryl in their small town of Letterkenny. Today, though, there were two massive announcements regarding Letterkenny that really make me happy when it comes to the success of the show and the people that work on it. I'll let the press release from BellMedia handle this announcement. CraveTV and LETTERKENNY producers New Metric Media announced today they are joining forces to build the small-town, smash hit comedy beyond the series itself into a worldwide entertainment brand. The initiative is a comprehensive multi-year partnership that includes an unprecedented production commitment, investment in the support of any existing and new ancillary brand extensions, and a partnership on the international sales and distribution of the series, alongside DHX Media. The deal was negotiated by Bell Media’s Justin Stockman and Carlyn Klebuc, as well as Mark Montefiore of New Metric Media, and Jayme Alter, Denton’s Canada LLP. In the comprehensive agreement, CraveTV and New Metric Media will partner on the production of more than 40 new episodes. With seasons 1-3 currently streaming, the agreement commits to a total of at least 73 episodes of the award-winning original comedy. CraveTV’s commitment to brand support includes the continued cross-platform marketing campaigns for the series, as well its brand extensions including sought-after LETTERKENNY merchandise and the highly successful Puppers Premium Lager, in partnership with Stack Brewery in Sudbury. As well, the partnership includes cross-promotional support for the just-announced, 26-city LETTERKENNY LIVE! tour, a 90-minute comedy experience starring Jared Keeso (Wayne), Nathan Dales (Daryl), K Trevor Wilson (Dan) and Mark Forward (Coach), kicking off in Halifax on February 28th, with plans to extend into the U.S. Finally, CraveTV and New Metric Media's multi-year commitment includes partnering on the sale and distribution of the series and its format, alongside DHX Media, to the international market. The series and format was officially rolled out to International buyers this week at MIPCOM in Cannes, France. The two good ol' boys from Letterkenny are going worldwide! How cool is that? Well done, Jared, Nathan, and everyone on the show for this monumental announcement! More than forty new episodes are on the way, the brand and its extensions will see marketing dollars spent on them, and it means that Jared, Nathan, Tyler, and the rest of the Letterkenny cast and crew will have work for multiple years! That's fantastic news! I feel lucky that I've had a chance to get to know Jared Keeso as his career took off. I was privileged to watch him on the ice as Don Cherry when he filmed the story in Manitoba. I was psyched that he received small parts in both Elysium and Godzilla. I was thrilled for him when he landed the part of Ben Chartier on 19-2, and watching him weekly on that gritty police drama really showed how good of an actor he is. And then, of course, he plays the role of Wayne on Letterkenny which started as a YouTube video and now has grown into a worldwide phenomenon. His success is proof that if one works hard, good things happen and I am extremely happy for his success! Yes, I am an admitted Jared Keeso fan! Well done, Jared! Who would have thought two Flames fans would soon be household names across the planet? We enter the third week with the usual suspects on top of the Canada West standings. However, there are some teams who either have been playing well or have been slightly inconsistent below those two teams, and we'll see where that brought us this weekend as the fifth and sixth games of the Canada West women's hockey schedule were played. Seven points separated first-place UBC from eighth-place Mount Royal, so every point mattered once again early on. Let's see how this week's action unfolded on The Rundown! UBC at REGINA: The top-two teams in Canada West hockey met early this season as the Thunderbirds traveled to Regina. The first period would see no scoring as it seemed like the two teams were feeling one another out, and there were only two minor penalties handed out per side with UBC carrying an 11-8 advantage in shots into the intermission. The second period? It was go-time. Bailey Braden cashed in a rebound off a Mariah McKersie shot that Tory Micklash couldn't handle to put Regina up 1-0 at the 3:05 mark. The Cougars kept coming at UBC, and they were rewarded with a second goal. Emma Waldenberger collected a rebound off a Sam Geekie shot, and she whacked home her third goal of the season at 9:05 to make it 2-0 for Regina. But a two-goal lead is the worst lead in hockey, and UBC proved why. Captain Celine Tardif loaded up the cannon and found the back of the net at 12:34 to cut the lead to 2-1, and Brielle Bellerive chipped a rebound home off a Kathleen Cahoun shot that Morgan Baker couldn't freeze while on the power-play. At 18:13, we had an even game at 2-2. However, the fireworks hadn't even started. At the end of the period, YBC's Kirsten Toth was assessed a four-minute double-minor for a check to the head while Jaycee Magwood took a minor for bodychecking. Both players tussled, causing Toth to receive another roughing minor, and the referees decided both players needed time to cool off with ten-minute misconducts. Wow. The extended Regina power-play didn't need long to capitalize in the third period. Jordina Kulbida took a pass from Martina Maskova high in the zone, and her long shot somehow eluded Micklash up high for the power-pay goal to put Regina up 3-2 at 1:08. Penalties, though, would be Regina's undoing of this lead. Four seconds after Maskova's penalty had expired, Emily Costales hit Ireland Perrott in the slot with a pass, and Ireland's quick shot was behind Baker less than a second later as she tied the game at the 9:39 mark. It seemed like these two tams were content to beat the hell out of each other, but another penalty cost the Cougars. Braden was sent to the box at 18:09 to put UBC back on the power-play, and they ended it. Tardif found a wide-open Hannah Clayton-Carroll on the backdoor, and Clayton-Carroll had no trouble with the tap-in at 19:08 to give UBC the 4-3 victory. Tory Micklash was huge in the victory, stopping 39 shots on the night, while Morgan Baker suffered the loss despite making 31 saves. UBC at REGINA: If Friday night's game felt like a full-on playoff war, Saturday's game was just as physical as these two teams develop some real hatred for one another. Like Friday's game, there was no scoring in the opening frame, but the two teams were far more cautious defensively as UBC took a 6-4 lead in shots to the dressing room. If you're following this script, you know what happens in this period. Four minor penalties were handed out to each team, but unlike Friday there was only one goal scored! Jaycee Magwood fed Tamara McVannel at the point, and McVannel's shot cleanly beat a screen Amelia Boughn at the 5:05 mark to give Regina the 1-0 lead! It appeared we might have a two-goal lead, but Emma Coulter was ruled to have interfered with Boughn as the puck entered the net, and that goal was waved off. Despite all the power-plays, we'd head to the third lead with that slim Cougars lead. In the final stanza, UBC ran into some penalty trouble that limited their chances, but it was an impressively aggressive Cougars team that outshot UBC 12-3 to keep the T-Birds from mounting any offence. When the final buzzer rang out, Jane Kish had closed the door on the Thunderbirds for the 1-0 win! Kish recorded a mere 13 saves on the night for the shutout while Amelia Boughn stopped 22 shots in the loss. CALGARY at ALBERTA: Canada West's third-place team had a home-and-home with the improved Calgary Dinos this past weekend. The teams would play in Edmonton before heading south, and the home team would be the first to strike in this game. Hannah Olenyk found herself all alone as she broke in on Kelsey Roberts, and she pulled off a gorgeous deke, pulling the puck from her backhand to her forehand and around the outstretched leg of Roberts to slide it home for the 1-0 Pandas lead just 4:49 in. The Pandas doubled their lead just forty seconds later when Ashley Morin gained a step on Paige Michalenko and wired a shot past Roberts for the 2-0 lead. To add a little salt to the two-goal wound, the Pandas completely dominated the period, outshooting the Dinos 12-0 by the time the clocked reach 0:00 in the first period. The second period saw the Dinos come out with a little more gusto, and they were rewarded when they scored on their first shot of the game. Some good passing on the power-play saw Laine Grace feed Sage Desjardins at the edge of the crease, and she tapped the puck home into a yawning cage with Dayna Owen out of position to make it 2-1 at 4:08. Calgary was the more aggressive team in the second period, leading 8-7 in shots in the middle frame, but they would get no closer as the Pandas and Dayna Owen took the 2-1 lead into the second intermission. The third period, however, was another smothering showcase of dominance by the home team as the Pandas completely shut the Dinos down once more. Roberts was outstanding in keeping the game a one-goal difference, but she can't do everything out there as Alberta outshot Calgary 11-1 in the final period. In the end, it just wasn't enough as Alberta took this game 2-1. Owen had a rather quiet night in making eight stops of the win while Roberts was spectacular in 28-save loss. ALBERTA at CALGARY: The second-half of the home-and-home series went three hours south via Highway 2 as the Pandas and Dinos met in Calgary on Saturday. Both teams came out the gate fired up with some solid end-to-end action to begin the game, but it would be the Pandas who would strike first on the power-play. With Holly Ruether sitting in the box for a bodycheck, the Pandas moved the puck around until Cayle Dillon could get a quick snapshot off that would be deflected in front by Autumn MacDougall past Kelsey Roberts at 7:42 to give the Pandas the lead. Both teams would continue pressing, but there would be no other goals despite the two teams being even at eight shots apiece through twenty minutes. The Pandas would use the power-play early in the second period to double their lead. Sage Desjardins was whistled for hooking, and the Pandas needed just 23 seconds to make it 2-0. After gaining control of the puck, Taylor Kezama took a pass from Dillon and fired the puck past Roberts at 3:46 to make it a two-goal game. From that point on, it was the goaltender show as both Kelsey Roberts and Kirsten Chamberlin thwarted chances at both ends of the ice. A scoreless third period would see the goalies duel again, but the final buzzer left the Pandas holding that two-goal lead and a second victory over the Dinos. Chamberlin was solid all night in stopping all 14 shots sent her way for her first U SPORTS shutout and first U SPORTS win while Roberts was outstanding in a 32-save loss. MANITOBA at SASKATCHEWAN: It seemed odd that Manitoba would have their top-three centers out for a game against their prairie rivals, but the injury bug has bitten the Bisons early. Saskatchewan was looking to keep their lead on the Bisons in the standings, but the first period would help neither club as both Manitoba's Lauren Taraschuk and Saskatchewan's Chloe Marshall were solid in keeping this a scoreless game. The second period was more of the same as the two netminders stood their ground. However, Leah Bohlken would have none of it as her wrister from the face-off dot had eyes in finding room under Taraschuk's left leg at 3:52 to put the Huskies up by a goal. Despite the Bisons outshooting the Huskies 9-8, Marshall wouldn't be fazed as she kept this game a one-goal affair through forty minutes. The Bisons looked to capitalize on an early power-play in the third period, but Marshall made a couple of great saves to keep the Bisons off the board. It would be a late power-play where the Bisons nearly found the equalizer, but the puck found the crossbar and stayed out before Erica Rieder had a chance seconds later, but Mashall again denied the Bisons from finding the twine. At the end of the night, the Huskies pitched the 1-0 shutout! Marshall stopped 25 shots for her first U SPORTS shutout while Taraschuk was solid in stopping 20 shots in the loss. Highlights of the game can be seen below! MANITOBA at SASKATCHEWAN: It was a little hard to believe that with all of Manitoba's firepower, they were shutout the night before. Could the Huskies continue that shutout streak versus the Bisons? That answer would be no as the Bisons opened the scoring at 14:12 of the first period when Jordy Zacharias picked the pocket of a Huskies defender, cut towards the net, and dragged the puck around Chloe Marshall before tapping it into the yawning cage on the backhand for the 1-0 Bisons lead that they would maintain into the intermission. Manitoba would double their lead early in the second period. After some strong work behind the net by a couple of players, the puck came out to Alanna Sharman who went high on the blocker side past Marshall from the hash marks to make it 2-0 at the 3:48 mark. The Huskies would respond minutes later. Kaitlin Willoughby picked up a loose puck near center ice, skated it into the Manitoba zone on the right side, and let a wrister go from inside the face-off circle that found the net just inside the far post past Rachel Dyck at 7:11 to make it a 2-1 game. Dyck, however, was sharp all period long as Saskatchewan outshot Manitoba 13-3 in the frame, but could only boast the one goal. It took another solid individual effort from Willoughby in the third period to even the score. Willoughby came into the zone against Erica Rieder and got a shot off that Dyck was able to kick aside, but Willoughby followed her own shot and slide the rebounder under an outstretched Dyck at 11:50 to tie the game at 2-2! The Bisons, though, would find a third goal on the power-play. With Emily Upgang sitting in the box, Erica Rieder looked like she had a goal when she rang her slap shot off the crossbar. Manitoba would recover and control the puck, and a cross-ice pass from Alanna Sharman to Rieder standing inside the face-off circle was one-timed by Rieder past Marshall at 15:33 to put Manitoba back up by a goal! From there. Rachel Dyck held the fort as Manitoba captured the split with Saskatchewan with the 3-2 victory. Dyck made 25 saves in the win while Marshall stopped 19 shots in the loss. Highlights are below! LETHBRIDGE at MOUNT ROYAL: Lethbridge and Mount Royal generally aren't near the top of the standings when the dust settles, but Lethbridge came out of the gates early with strong goaltending from Alicia Anderson to pick up some important points in their first games despite not having a regulation win. Mount Royal, on the other hand, was also looking for its first regulation win of the season, and they needed points to remain relevant early on in this Canada West season after dropping both games a week earlier. It would be the visitors, though, who struck first. Jodi Gentile's slap shot was stopped by Zoe DeBeauville, but Tricia Van Vaerenbergh was in perfect position to tap in the rebound at 3:24 to give Lethbridge the 1-0 lead. That goal seemed to awaken the sleeping Cougars who peppered Anderson and the 'Horns with 15 shots throughout the period to Lethbridge's four shots, but they couldn't solve the netminder through twenty minutes. While there was reported about it after the game, Emily Severson replaced Zoe DeBeauville to start the second period, leading to speculation that perhaps DeBeauville had been injured in the first period. It didn't seem to matter to the Pronghorns, though. Katelyn Breitkreuz found a puck in a scramble in front of Severson, and she slid it past the goalkeeper for a 2-0 lead just 47 seconds into the frame. Again, the Cougars responded by taking the game back at the Pronghorns, but Anderson was equal to the task. The Pronghorns went up by three towards the end of the period when Alli Borrow tipped Jodi Gentile's point shot past Severson at 15:48, and that lead became a four-goal lead minutes later on the power-play when Delaney Duchek deflected Eryn Johanson's slap shot past Severson at 18:37. The only question needing to be asked in the third period was whether or not Anderson would hold her shutout. That answer, unfortunately, was no as Kate Hufnagel picked up a rebound off a Tatum Amy shot on the power-play, and netted the puck behind Anderson at the 7:30 mark to make it 4-1. That would be all the offence that Mount Royal would find on this night, though, as the Pronghorns, backed by an outstanding goaltending performance by Anderson, take the Friday night game by the 4-1 score. Anderson made 31 stops in the victory while Severson stopped 12 shots she faced. For the record, DeBeauville took the loss after making three stops on four shots in the opening period. MOUNT ROYAL at LETHBRIDGE: The second-half of the home-and-home between these two southern Alberta teams went down in Lethbridge, and the game had a different feeling than the one before it in Calgary. Mount Royal was the far more aggressive team in the opening period, but the Pronghorns had chances of their own. The only problem? Lethbridge's Alicia Anderson and Mount Royal's Zoe DeBeauville were having none of it. Through one period, we had a scoreless draw with Mount Royal leading in shots with a 15-9 margin. It would be early in the second period when the Cougars finally solved Anderson. Megan Carver's shot from the right face-off circle glanced off a Pronghorns defender to get by Anderson at 5:19, and the visitors were ahead 1-0. Later in the period with the teams playing four skaters aside, Tianna Ko split the defence off the half wall in the Proghorns' zone, and she went short side on Anderson to make it a 2-0 game. The Cougars dominated in the second period and came away with two goals while outshooting the Pronghorns 18-2 and 33-11 overall! Carver would add her second of the night and third Cougars goal on a great individual effort while shorthanded. Carver blocked a shot and raced away on the breakaway where she deked forehand-backhand and made a good shot that appeared to have been stopped by Anderson's glove, but the puck had just enough power to trickle across the line at 4:40 for the 3-0 lead! While the Pronghorns had chances in the final fifteen minutes, none were good enough to beat DeBeauville on this night as she and her Cougars came away with the 3-0 victory! DeBeauville was perfect on all 18 shots she faced while Anderson made 39 saves in the loss. These standings are starting to look oddly familiar as we make our way towards Week Four. I'm a little concerned about Manitoba's recent rash of injuries that will only be complicated by Venla Hovi's leaving the team for the Four Nations Cup as Finland prepares for the 2018 Pyeongchang Olympics. They dp have great depth, but that depth may be tested early with Venla scheduled to be in Tampa Bay until November 12. We'll have to see how the Bisons weather the storm over the next few weeks. Aside from that, the Pandas are rounding into form, the Thunderbirds continue to roll, Regina is proving they're the real deal, and Saskatchewan is proving they're a tough bunch to handle. If you're not excited for the remainder of this season, you might need to see if you still have a pulse! If there's one thing I've noticed since I started the Teebz's Book Club, it's that there are exponentially more books for adults than there are for kids when it comes to hockey. Teebz's Book Club is living proof of this fact, so I'm always tickled when a publisher mentions that they have a new book suitable for kids that deals in the topic of hockey. Teebz's Book Club is proud to review When The Moon Comes, written by Paul Harbridge, illustrated by Matt James, and published by Tundra Books. When The Moon Comes has been shortlisted for the 2017 Governor General's Award for Young People's Literature, and that's a huge honour for any book. I was quite excited to have the opportunity to read and review this book for that very reason, so let's find out if it lived up to its hype! 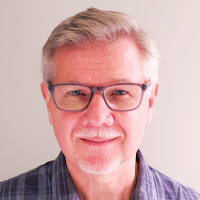 From the press release, "Paul Harbridge is the author of the picture book Helena's Voyage and several published short stories. A graduate of the University of Toronto, he works as a speech-language pathologist with adults with developmental disabilities. He and his wife, Isabel, live in Etobicoke, Ontario, and are the proud parents of Daniel and Helena." Paul won a Judge's Choice award in 1988 in the Toronto Star for his short story entitled "Hunting With His Dad" about growing up in Gravenhurst and going hunting with his father in the woods. He's also a season ticket holder for the CWHL's Toronto Furies! His website can be found here. 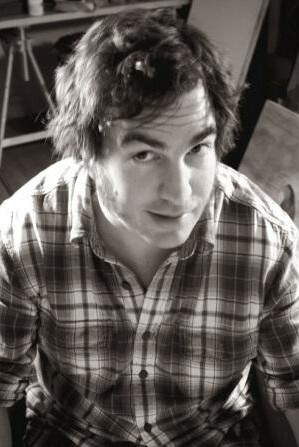 From the same press release, "Matt James is a painter, illustrator and musician. His books have won many awards, including the Boston Globe-Horn Book Award, the Marilyn Baillie Picture Book Award, the New Mexico Book Award, and the Governor General's Award. Matt lives in Toronto with his family." He was also an artist for the 2013 TD Summer Reading Club, and his works have been featured in the True North Gallery, also known as The Music Gallery of Fine Art, is the world’s first fine art gallery dedicated to visual art by musicians, and artwork connected to the music experience. His website can be found here. When the opportunity to review When The Moon Comes was presented to me, the book was pitched by the publisher as being of the same nostalgic factors as Roch Carriere's classic tome The Hockey Sweater. This is a very lofty statement to make, so I was instantly curious as to whether When The Moon Comes could carry that weight. When The Moon Comes follows a group of kids who await the right moment to make the trek through the forest behind Arthur's farm to the pond formed when the beaver dam flooded the gully. The night finally arrives in November when the full moon appears and the ice is strong and fast. In the darkness of night, the full moon acts as a floodlight on the kids who have made the trek to skate on the pristine ice, sit around the fire with Arthur and enjoy warm beverages, and skate until the wee hours of the morning. For many parents, this was their first hockey experiences in small towns across Canada. Honestly, the imagery within the covers of When The Moon Comes is fantastic, and Matt James' work should be commended. His illustrations fill each page and capture the moments of the story beautifully. I`m not sure if Mr. James will ever be reproducing these illustrations, but I`m quite certain he could fetch a few dollars if he ever decided to make them available. On the beaver flood, I feel through the snow with my stick, and Arthur is right. The ice is waiting, perfect. "Wonderful ice," says Arthur. "Magic ice." As I stated above, the comparison to Monsieur Carrier's story of The Hockey Sweater may have been a little presumptuous simply for how timeless the latter story is. That being said, When The Moon Comes offers the same nostalgic feeling in its story, and I can honestly say that I have trekked to a few outdoors rinks across school fields in a foot of snow just for a skate in my time. 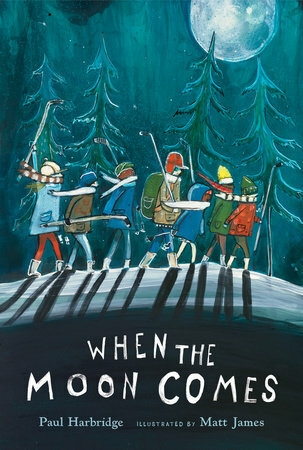 When The Moon Comes has the potential to be a story similar to The Hockey Sweater, but it needs a few more years of telling and retelling the story under its belt to reach the status and revere that Monsieur Carrier's story holds. All that being said, though, I really enjoyed the whimsical story and excellent illustrations in When The Moon Comes. According to his website, Mr. Harbridge had been sitting on this story for twenty-five years before finally publishing it! In refining the story over the years, Mr. Harbridge has crafted the story to pull on the heartstrings and have us dip back into simpler times where a frozen pond and a few frigid nights turned winter into a playground for kids. It's in those memories that parents will reminisce as they read this story to their children, and those children will see the memories come flooding back in their parents' eyes. Because of this, When The Moon Comes is absolutely deserving of the Teebz's Book Club Seal of Approval! When The Moon Comes has been out for a month in local bookstores and libraries, and I highly recommend you find a copy for your young reader. This book is suitable for all readers, including the youngest and developing readers, and, with any hope, it should start finding a place on night tables and bookshelves for all children across this great land! Ever since UND decided to eliminate its women's hockey program, I have been drifting without a team to follow. There are players that I'm cheering for - Wisconsin's Kristen Campbell, for example - but I needed a new program to sink my loyalty into, and I may have found it with the Colgate Raiders. I made the commitment after Krista Patronick took over the reigns as Director of Women's Hockey Operations at Colgate University and appeared on The Hockey Show. Needless to say, I may have hitched my wagon to one heckuva program after tonight's game! I had asked Krista when she appeared on the show if she was worried about the early schedule with teams such as St. Cloud State, Northeastern, and Mercyhurst on the docket, but she said she wasn't worried at all. At the time, I might have dismissed the comment as an employee of Colgate putting faith in her own program, but it seems my dismissal might have been both erroneous and premature. After downing both St. Cloud State and Northeastern by a combined 16-2, the fifth-ranked program in the nation welcomed Mercyhurst to the Class of 1965 Arena. Goaltender Liz Auby had set the Colgate women's team's shutout streak at 308:44 in her three shutouts to start the season before Northeastern finally found a crack in the Auby wall late in the second period, so Mercyhurst had a tall task in front of them as they began the weekend series with the Raiders tonight. While Mercyhurst entered the game with a 1-4-1 record, Colgate certainly wouldn't take the Lakers lightly. After Colgate surrendered a goal late in the third period to allow Mercyhurst to tie the game at 3-3, overtime loomed. It would take nearly the entire five-minute extra frame to find a winner, but we did find one just in the nick of time! One day after she took over Colgate's Instagram account, Jessie Eldridge went and did this. Despite what the voice on the video stated, Eldridge scored with one second remaining in overtime to give the Colgate Raiders their fifth-straight win to open the season! The great lead pass came from the player who did the pickpocketing of the Laker in the offensive zone, and freshman Malia Schneider went tape-to-tape to send Eldridge in with speed. Moments later, there were team hugs in the corner as it was game, set, match with Eldridge's second goal of the night! I feel pretty confident in my choice for a new NCAA team to follow after seeing them start the season 5-0-0. They play Mercyhurst again tomorrow, and then they go on the road against the Clarkson Golden Knights and perhaps their toughest match to date with the sixth-ranked St. Lawrence Saints next Saturday. I have faith, though, that players lake Shae Labbe, Jessie Eldridge, Shelby Perry, Malia Schneider, and Liz Auby will do their part in keeping this magical season alive! Heckuvan ending tonight, though. Well done, Raiders! The Hockey Show, Canada's only campus-produced radio show that strictly talks hockey, is back tonight with a special show as we're knee-deep in Pledge-O-Rama for another season! 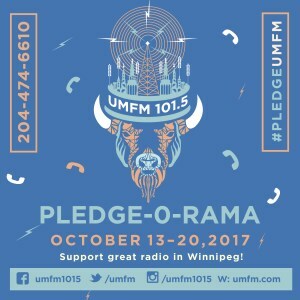 Pledge-O-Rama is UMFM's annual pledge drive that goes to help us fund capital projects at the radio station such as equipment upgrades, a new transmission tower that was installed and activated this summer, and other major upgrades in and around the station. Being that UMFM is a non-profit station, any black ink on the bottom line gets invested back into the station, so Pledge-O-Rama helps us out immensely in bring you quality and unique programming that you won't find anywhere else! Tonight, Beans and I are thrilled to welcome this beauty to the show. That's Rob Ullman, and he's a talented and incredible artist who has a pile of success to his name with everything he's been involved with in his career. He has worked with minor-league baseball's Richmond Flying Squirrels to come up with their eleven t-shirt designs this past summer, creates his own unique sports artwork, he's the staff cartoonist at Dejan Kovacevic's Pittsburgh-based website, and he's contributed to a number of other websites with his artwork. In other words, he's a pretty darn good at what he does! Tonight, Beans and I will talk to Rob about his art, jerseys, his beloved Pittsburgh Penguins, his family and more as we get to know Rob Ullman tonight on The Hockey Show's Pledge-O-Rama Extravaganza! I was going to paste the whole rigmarole about the Pledge-O-Rama stuff again, but I did that last night. Click here for more details! And remember that any donation of $50 or more gets you entered into the draws for Rob's art! So now you might be saying, "Teebz, I know Rob!" or "Teebz, I like his art and want to know more about him. How can I listen?" We suggest that you download the UMFM app on your phone or tablet. It's the easiest and most convenient way to listen to any of UMFM's great shows any time of the day, so go get it! Just follow this link on your iDevice or this link for your Android device and get the UMFM app! It's never been easier to tune into The Hockey Show or UMFM! Download the UMFM app today, and don't miss any of our great programming or shows! Tonight, Teebz and Beans talk The Tragically Hip, hockey, art, family, jerseys, Pittsburgh, Richmond, and more as we get to know artist Rob Ullman only on The Hockey Show found on 101.5 UMFM and on the UMFM app! 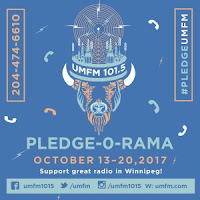 UMFM, the home of The Hockey Show, is currently in its week-long pledge drive known as Pledge-O-Rama. Pledge-O-Rama is important to the station because it helps us raise funds for capital improvements that often are priced beyond our normal operating budget. Some of the improvements we've done over the years include paying for the remote broadcast units, upgrades to station audio equipment, and covering the costs of a new transmission tower as we move from analog to digital and remain current for another twenty-five years. Needless to say this is a big week for the station! If you enjoy our crazy program or any of the other programs on UMFM, The Hockey Show wants you to donate. As of right now, we're sitting at $30,033.46 of our $34,000 goal, so we're not far off with a couple of days to go. You can make a donation in a few different ways, so let's get to this. You can always call us at 204-474-6610. Email us at pledge@umfm.com and we'll get back to you. Use the online donation form. Visit us if you're in the University of Manitoba area. What do you get for donating? There's some great shwag up for grabs! UMFM Tote Bag: a classic heavy duty canvas bag! So how many clams will this stuff set you back? $150 – UMFM’s Friends With Benefits Card, UMFM Earplugs, Stickers, UMFM Tote Bag, UMFM Beer Stein, UMFM Pledge T-Shirt, UMFM Toque and 1 entry into our special Golden Ticket draws – there are 8 of them! $250 – 2 UMFM Friends With Benefits Cards, 2 sets of UMFM Earplugs, 2 UMFM Tote Bags, 2 UMFM Beer Steins, 2 UMFM Pledge T-Shirts, 2 UMFM Toques, a new UMFM Sweatshirt and entry into our special Golden Ticket draws – there are 8 of them! But here's where the fun part happens. The Hockey Show wants you to get all that stuff above at the level you're able to make a donation. We're going to add some more fun on top of whatever incentives you want, though, as we have a pile of stuff to give away. All it will take is a donation at the $50 level or more, and we'll enter your name in the draws we'll be making! Our guest tomorrow is the amazing artist Rob Ullman. Rob worked with minor-league baseball's Richmond Flying Squirrels to come up with their eleven t-shirt designs this past summer, and that's a huge honour for the Virginia-based artist. 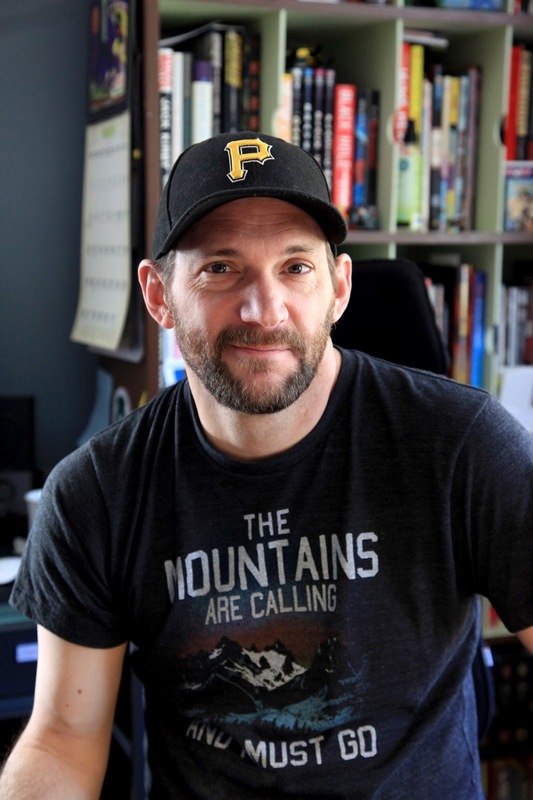 He also does a pile of other sports artwork, he's the staff cartoonist at Dejan Kovacevic's Pittsburgh-based website, and he's contributed to a number of other websites with his comics. I am proud and honoured to call him a friend, and I'm happy to announce that we'll be giving away a pile of his artwork! We have a pile of hockey prints to give away. There are six (6) Mark Scheifele prints, one (1) Sidney Crosby print, one (1) Claude Giroux print, one (1) Pekka Rinne print, and one (1) Jonathan Toews print. Everyone who donates at the $50 level or higher will have one of these prints added to their UMFM prizes while supplies last. If there are more than ten people who donate - which would be awesome as that's $500 or better into UMFM's coffers - we'll draw to see who receives a print. Maybe you want something more original with a little more depth? We'll give away two (2) copies of both editions of Rob's hockey comic books entitled Old-Timey Hockey Tales! Each of the two-volume comic book packages comes with an Atom-Bomb Bikini sticker and a Rob-designed "51 Years" sticker commemorating the five Pittsburgh Stanley Cups in 51 years! 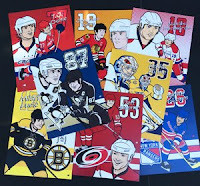 Each of the comic books illustrates some hockey history such as the Miracle on Manchester, Gratoony the Loony, the '78 Leafs and their invisible names, and the story of Bill Barilko. Needless to say, these are great additions to a hockey fan's bookshelf! Maybe you're more into Rob's pin-up work and want something like that? We have a prize pack that we'll draw for consisting of one (1) copy of the Nordiques-themed cover of Blue Lines Volume 2 and an original Rob Ullman Nordiques hockey card! 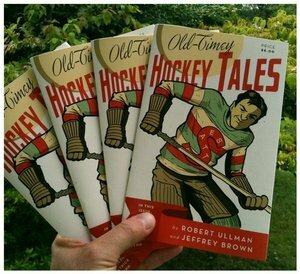 As per Rob, the book contains "digest-sized collections of my hockey-themed pin-up commissions and Stanley Cup playoff drawings" and is numbered 17/300 as it is a limited publishing run. The Nordiques hockey card is an original drawing of what appears to be Eric Lindros in a Nordiques uniform, and is labeled 6/27/12 on the reverse! Of course, Rob also does larger cardstock art, and this is one of those options. Rob has sent an inked Terry Sawchuk original design, and it's a beauty. Terry, as you may be aware, was born in Winnipeg, and made a name for himself in the NHL with Detroit, Toronto, Los Angeles, and Boston in his illustrious career before he passed away on May 31, 1970. Sawchuk was born in the north end of Winnipeg, and raised in Elmwood where he not only played hockey, but also suited up for the Elmwood Giants baseball club where he won the league's batting title in 1948! If you're a fan of the Red Wings or you want a great discussion piece for your wall at home, this is the piece! We'll make a draw for this as well! Finally, we have one last original piece of art that we'll draw for tomorrow evening, and that's for a Winnipeg Jets pin-up girl that Rob had made up specifically for this event! This piece of art would be a great addition to any Jets fan-cave, and it looks outstanding! We'll include this in the draws as well! Again, we're excited to have Rob on the show tomorrow, and we're pushing hard towards the $34,000 goal for UMFM. We're less than $4000 away from the goal, and we really could use any and all support you can provide. Anything over $50 not only gets you the great UMFM gear, but entered into the draws for this great art from Rob Ullman, so please give what you can to help the radio station!